Salmon Teriyaki Noodles - moist and juicy salmon and rice noodles made with San-J Tamari. 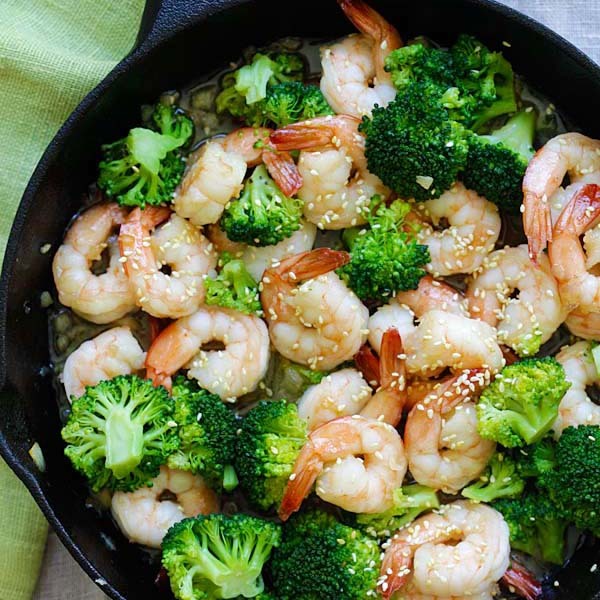 Gluten-free, healthy family weeknight dinner. When it comes to Asian cooking, there is one ingredient that is indispensable in my pantry: soy sauce. I use soy sauce on a daily basis, making everything from Chinese, Japanese, Korean, Southeast Asian dishes, to soups and salads. 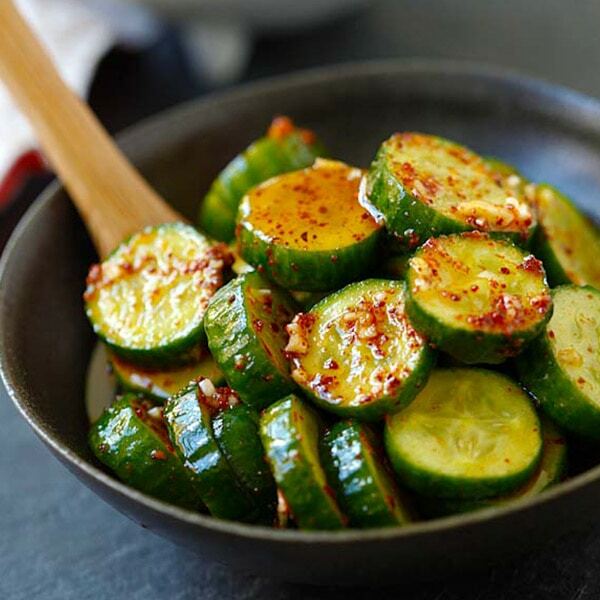 I use it as a seasoning sauce, marinade, glaze as well as dipping sauce. 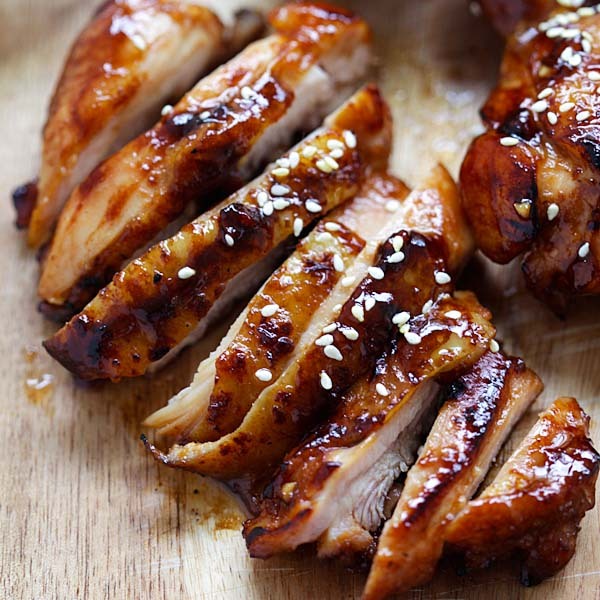 Soy sauce is probably my favorite sauce in the whole world and one of the recipes I love most with soy sauce is chicken teriyaki. My love affair with soy sauce means that I am constantly in search of the perfect bottle of naturally brewed, non-GMO, and the highest quality soy sauce available. I have a couple of brands that I use in my kitchen, one of them is San-J Tamari. Tamari is a premium Japanese soy sauce made with all soybeans or mostly soy beans, with a richer, smoother taste and naturally brewed. When it comes to soy sauce, you should always choose naturally brewed soy sauce instead of the cheaper and lower-grade chemically processed brands with artificial colors, preservatives or additives. San-J Tamari is made with 100% soy, naturally brewed for up to six (6) months with no wheat. It’s certified Gluten Free, Vegan, Kosher and non-GMO verified. To showcase the amazing flavor and depth of San-J Tamari, I made this absolutely delicious and super easy Salmon Teriyaki Noodles, a light and healthy weeknight dinner that your entire family will thoroughly enjoy. You could use some homemade teriyaki sauce which takes only three (3) ingredients to make: San-J Tamari, mirin and sugar. Or if you are a busy mom like me, you could also take a shortcut by using San-J Teriyaki Sauce which is made with their Tamari. Drizzle the teriyaki sauce on any protein of your choice, for example: salmon, chicken, beef, and serve with rice, pasta, noodles, and you have an amazing, wholesome, and healthy meal for your family. For my recipe, I chose rice noodles to make it into a Gluten Free dish. This recipe takes about 30 minutes to make but the flavors are complex and delightful, thanks to Tamari’s rich flavor. My family, including my 5-year old picky eater, gave me 2 thumbs way up on my homemade teriyaki sauce. The next time you are buying soy sauce, go for San-J Tamari, which comes in five different variations: Tamari Gluten Free Soy Sauce, Reduced Sodium Tamari Gluten Free Soy Sauce, Organic Tamari Gluten Free Soy Sauce, Organic Reduced Sodium Tamari Glute Free Soy Sauce, and Tamari Lite 50% Less Sodium Gluten Free Soy Sauce. Trust me, San-J Tamari may just be the best tasting and most versatile sauces in your kitchen. To buy San-J products, please check out the store locator. This conversation is sponsored by San-J. The opinions and text are all mine. Create delicious dishes from Tamari with San-J’s extensive recipe collection, from appetizers to desserts like Lamb Potstickers and Cherry Chocolate Cake with Tamari. For recipes visit: www.san-j.com/recipes and product details at www.san-j.com. 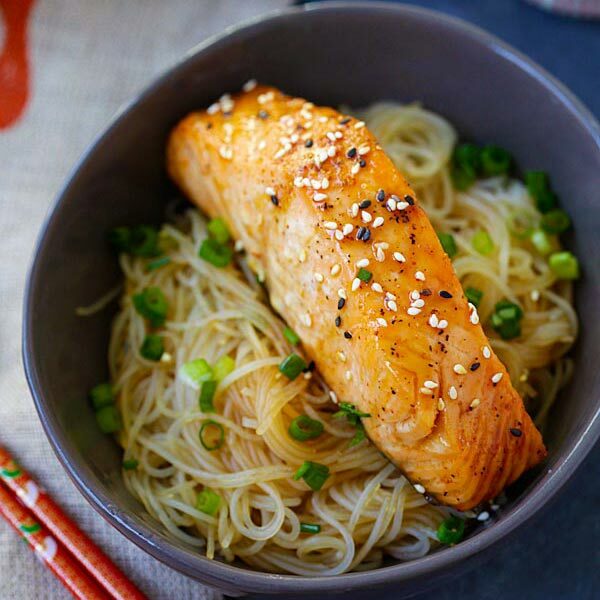 Salmon Teriyaki Noodles – moist and juicy salmon and rice noodles made with San-J Tamari. Gluten-free, healthy family weeknight dinner. Add all the ingredients for Teriyaki Sauce in a small sauce pan, simmer on low heat until the sauce slightly thickens. Set aside. Heat up a pot of water and bring to boil, cook the rice noodles according to the package instructions. Drained and transfer to two serving bowls. Sprinkle some salt and ground black pepper on the surface of the salmon. Arrange on a baking sheet lined with parchmeng paper and bake for 12 minutes, or until the inside of the fish is cooked. Arrange one piece of fish on top of the rice noodle and drizzle half of the teriyaki sauce on top of the salmon. Repeat the same for the second serving. Garnish with sesame seeds, chopped scallions and serve immediately. You could take a shortcut by using San-J Teriyaki Sauce which is made with San-Tamari if you don't want to make the teriyaki sauce from scratch. All photos and recipes on Rasa Malaysia are copyright protected. Please do not use the photos and recipes without prior written permission. If you wish to republish this recipe, please rewrite the recipe in your own words instead of copy and paste and link back to //rasamalaysia.com/salmon-teriyaki-noodles/. Thank you very much! Stunning. I have to make this tonight. Thank you. Have to try this. Been looking for a good salmon recipe. Where can I go get Tamari in California? Love this recipe I am discovering asian cooking more and more and I love it! What temperature do I bake the fish at? LOVE this recipe! It’s the only salmon dish I could put on a weekly rotation and still look forward to every time. I’ve made it multiple times and run out of the sauce every time. I’ll make double of that from now on. Thanks so much!